Everyone finds themselves in physically untenable positions at the start of tonight’s episode. Bruce is kidnapped by Galavan and promises that tonight at midnight, the Dumas family will be avenged, and the “sins of the Wayne family will be washed away in Bruce’s blood.” Alfred is running from Tabitha and her goons in the city dump, eventually hiding in an old freezer which is promptly buried by a huge load of garbage. Jim wakes from a nightmare about his time at the church with Barbara to find that he is at Ed’s apartment, with Ed and Penguin trying to explain to him that, if ever there was a time to work together, that time is now. Tabitha didn’t find Alfred, but isn’t too worried about it. Her brother finds her lackadaisical attitude appalling and the two spar verbally until Silver comes in. She claims she is getting sick and wants that to excuse her from tonight’s “ceremony,” but Galavan doesn’t buy it for a second. He doesn’t think Silver is cut out for the task. She is soft and has too much compassion. She promises that isn’t the case, so Theo gives her a test: make Bruce fall in love with her again. He must kiss her before his death. Tabitha tries to get Theo to lay off the kid, but Theo reminds them there are “other girls of the Dumas blood” that he can turn to. “Be resourceful, be brutal, and put on something pretty.” Tabitha is disgusted. If Silver fails, she will be dumped on the street – or just straight-out killed. Silver visits Bruce in his cell. She is there to apologize, claiming she had to do what her uncle said. She offers to keep Bruce company, but Bruce asks her to go. He has no feelings for her whatsoever. She apologizes again and tells him she really likes him. Bruce softens as she begins to leave, and he relents: “You can stay if you like.” She sits, but Bruce doesn’t feel like talking. Silence makes Silver sad, so she starts rambling about swimming with a dolphin that she believed could read her mind. Then she talks about a birthday party she had before her mom died. Bruce is somewhat surprised that Silver’s parents are really dead – she didn’t lie about that. Bruce softens more and shares a memory of camping with his parents. Silver has a sudden change of heart: “I can’t let you die.” She knows of a way out if they can get past the guard and reminds him that she is a Dumas. “I have some pull around here.” She calls over a guard, who unquestioningly turns over his gun to her. She shoots him in the leg, takes Bruce by the hand, and the two run. They don’t get very far when Theo and several members of the Order catch them. The pair are thrown back into the cell. Back at square one, Bruce dabs Silver’s tears. She is surprised at how calm he is, like he isn’t scared. Bruce says he isn’t. Silver admits she loves him and asks if he loves her. He doesn’t – he knows she is playing him. But he does pity her. When asked, she finally admits that Uncle Theo paid her to make Bruce love her and kiss her goodbye. She is hopeless, has done bad things that there is no returning from, and her family is all she has now. Bruce tries to convince her she is simply under the control of bad people, but Silver is too deep into her fog of despair. Lucius Fox has finally gotten the hard drive working, but can’t find Alfred or Bruce. A lamp has been knocked over, and a window is open, leading Fox to report them as missing persons to Barnes. They have only been gone for twelve hours but Barnes relents and puts out a call on them. Moments later he gets a call back: Alfred is in a holding cell in the police station. After freeing himself from the dump, Alfred tried to commandeer a car, but he was caught by the police, who tasered him and took him to jail. Fox thinks that this is the proof they need to get a warrant for Galavan, but Barnes points out that Alfred was technically trespassing and chased off the property by the rightful occupant. Talk about by-the-book! Barnes finally agrees to try for what is basically a backdoor warrant, but it will take at least until tomorrow to get. Luckily, Bullock isn’t so by-the-book and agrees to help Alfred. There is an arrest warrant out for Jim, which offends Lee. Barnes thinks he is dirty and thinks she may know more than she is telling. He softens and admits he doesn’t like it any more than she does. When he leaves, Ed approaches. Having overheard their conversation, he gives Lee a riddle that leads her to his apartment. She is greeted by Penguin’s men, all armed to the teeth. Jim de-escalates the situation and pulls Lee into the apartment, explaining that she needs to get out of town. She wants him to leave with her, but he can’t, so she drops a bombshell: she’s pregnant. This elicited a “whaaaat?” from me and an eyeroll from Penguin. Bullock agrees to help out Alfred, but they can’t do it alone. They wish Jim were there, and Ed overhears this. Another riddle, guessed immediately by Fox leads them to Ed’s apartment. They arrive as Penguin says goodbye to Jim and Lee, and the couple is about to drive off. Jim gets out of the car to speak to his friends, and Lee knows. She says she understands, but she isn’t happy about it. “Do what you think is best. Call me when it is over.” She drives off. Back in Ed’s apartment, Jim is prepping his team, which includes Alfred, Bullock, Penguin, and Penguin’s goons. Penguin wants to kill Galavan slowly; Jim wants to arrest him. Alfred doesn’t care – he just wants to get into Galavan’s tower and save “Gotham’s Son.” But suddenly they all realize that they don’t know how to get in. Selina shows up, promising to know a way in. Jim trusts her, she’s in. 11:55pm. Silver wants Bruce to stop acting like he isn’t scared. He feels alive, even happy. “I’m going to see my parents.” Barf. Theo arrives. Showtime. The kids stand, but Bruce turns to tell Silver he loves her, he forgives her, and he kisses her, essentially saving her life. Theo gives her a bravo, but she doesn’t care. 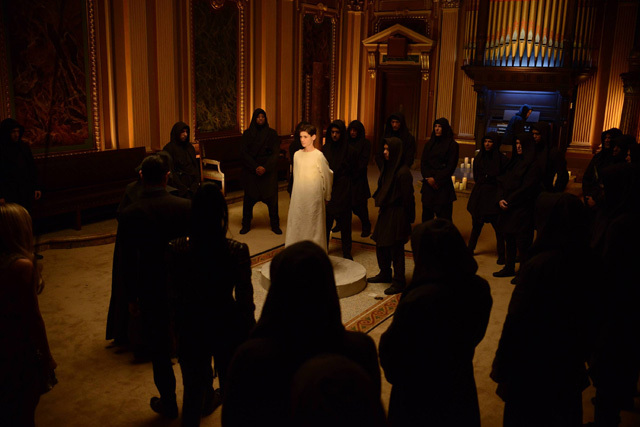 Bruce is led into a ceremonial chamber, filled with monks. 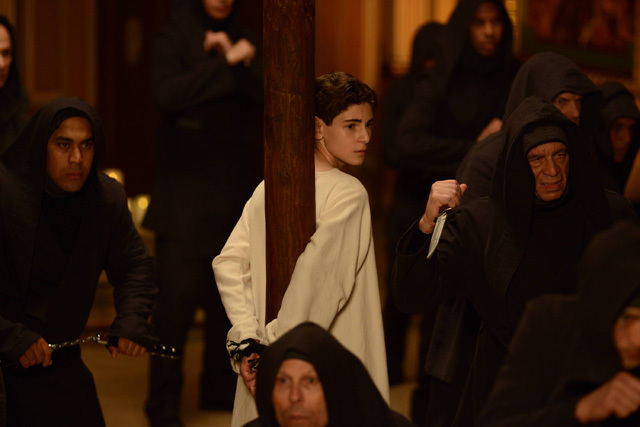 They chant, “Death to the son of Gotham” as he is tied to the stake. Jim and his band of Merry Men storm through the streets. Selina sneaks into the garage through a floor vent and jumps the single guard. With him unconscious, she opens the garage door and the troops storm in. They have a lot of stairs to climb, and Bullock is winded quickly. They hear the chanting out into the hall, and Jim’s vigor is renewed. 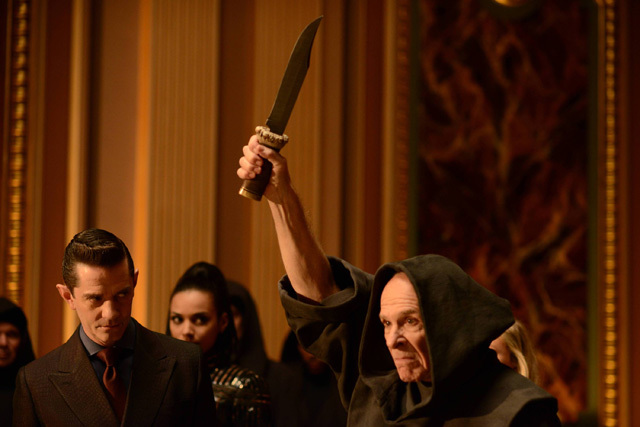 Silver looks scared as Father Creel takes the ceremonial blade from Theo and the chanting ceases. He says a few words, promises the prophecy is fulfilled, but before he can plunge it into Bruce, Silver screams “Stop!” They all freeze, but Silver realizes she hasn’t thought this through. Luckily Jim and his team burst in and they face off against the monks while Theo, Tabitha, and Silver flee. Jim, Alfred, and Selina are the three causing the most damage to the monks. Jim faces off with Creel, who leaps towards him with the knife. Suddenly the jump turns supernatural as he flies through the air. It turns out that Bullock finally made it up the stairs. He is out of breath but that doesn’t affect his aim, which takes out Creel mid-air. Alfred unties Bruce and hugs him fiercely, and Jim notices that Galavan is nowhere to be found. Theo and the girls have escaped to his penthouse, where the only way out is straight down. Unfortunately, he only has two parachutes; Silver is not coming with them. He moves towards Silver threateningly, and Tabitha tells him to leave her alone. Sick of his bullying, she knocks him out and gives his parachute to Silver. “You lost,” she tells Theo before kicking him one more time. “Time for me to look out for #1.” Tabitha pushes Silver out the window, then leaps after her. Jim shows up, startling Theo, and puts him under arrest. Theo relaxes and sits in a chair to cuff himself – he thought Jim was going to shoot him. “Thank god for simple men of principle,” he murmurs, and promises to get off on whatever charges Jim “thinks” he has against him. Jim starts to rough him up, and may have killed him had Barnes not walked in, thanks to a tip-off from Fox. Barnes makes Jim lower his gun and puts him under arrest – he is still a wanted man. Next through the door is Penguin, who knocks out Barnes with a vase, allowing Jim time to grab his gun. Penguin reminds Jim of all the horrible things Galavan has done to Jim, and that Theo has the courts in his pocket. Does Jim really want to play by the rules? “Think about it – but think fast,” Penguin urges as sirens approach. Penguin and Jim head down to the docks. At the water’s edge, Jim pulls Theo from the trunk and assures him that, while he has many regrets, this won’t be one. He turns Theo over to Penguin, who beats him mercilessly. Jim finally pulls Penguin off him – and shoots Galavan dead. He walks off in a haze, a haze that continues until he finds Lee in a serene garden. She doesn’t quite believe him when he says its over, but he asks her to marry him. She smiles. A body is brought into the secret Indian Hills facility. Dr. Peabody takes possession, and says professor Strange has “high hopes for this one.” Inside the body bag is Theo Galavan’s corpse, with an umbrella shoved down his throat. But the episode isn’t over yet. A middle-aged man is running through the streets, trying to find a car he can steal. They are all locked, so he takes cover behind a dumpster. Someone is stalking him, someone who I initially take for Firefly. But when this villain shoots, it is not with fire, but ice. Welcome Mr. Freeze.